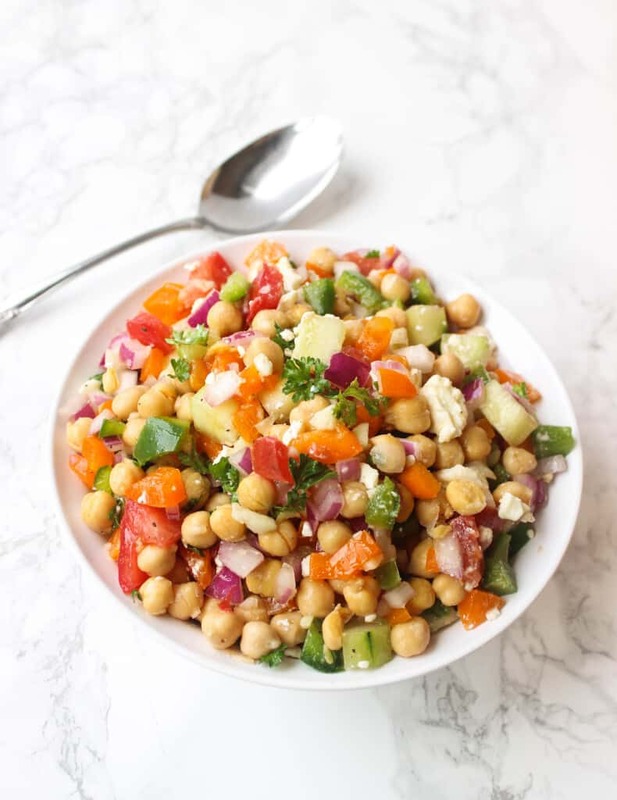 This Greek chickpea salad has chopped tomato, cucumber, bell pepper, red onion, feta cheese, and of course, chickpeas. There’s a simple olive oil and lemon dressing, and the whole salad takes less than 20 minutes to whip up. I have a thing for Greek salads. As in, I’ve eaten seven of them in the past seven days. Most of them have been at restaurants, like I’m some kind of restaurant critic on a quest to find the best Greek salad in the city. Although that would be a fun job, I’m just a girl who really likes Greek salads, staying for the summer with my grandparents who happen to like going out to eat. 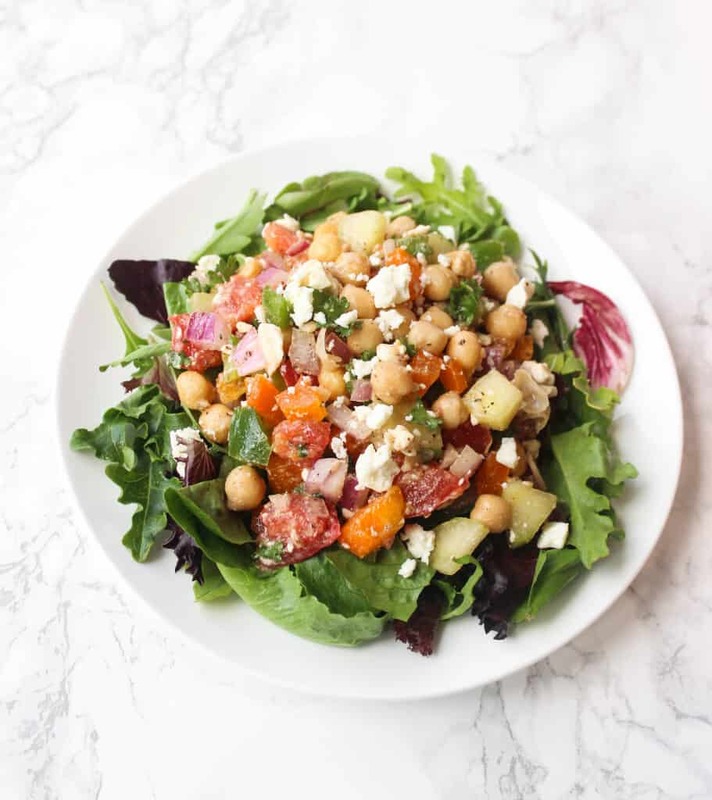 As delicious as some of those restaurant Greek salads have been, though, this homemade Greek chickpea salad may be even better because by making it myself, I can ensure that there’s a perfect topping : lettuce ratio. The toppings are the best part, so I definitely don’t skimp on those. 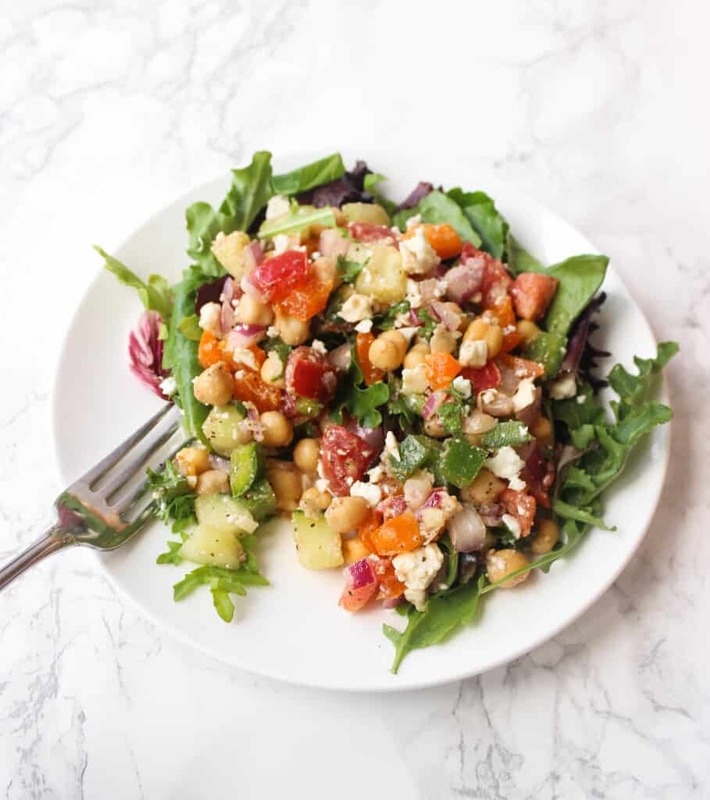 On the first day I made this Greek chickpea salad, I enjoyed it over mixed greens. The next day, I had it all by itself for lunch, no lettuce, with just some fruit on the side. The most time consuming part of making the salad is chopping all of the veggies, but I turned on my favorite music while I chopped and time flew by. All in all, the whole salad came together in just under 20 minutes, and chopping took maybe 15 of those minutes. Anyway, this would be a great thing to pack for a vegetarian lunch, bring to a neighborhood cookout, or enjoy at home to get your Greek salad fix. You could add olives, roasted eggplant or brussels sprouts, change up the dressing, add other spices– the possible adaptations are endless! 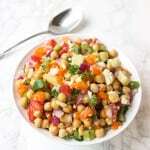 Combine chickpeas, chopped bell pepper, red onion, tomato, cucumber, optional olives, and garlic in a large bowl. Add olive oil, lemon juice, oregano, parsley, and salt and pepper, and stir well. If serving immediately, add feta cheese and stir very gently just before serving. If serving later, place salad in refrigerator for up to 4 hours and add feta cheese just before serving, stirring gently to combine. 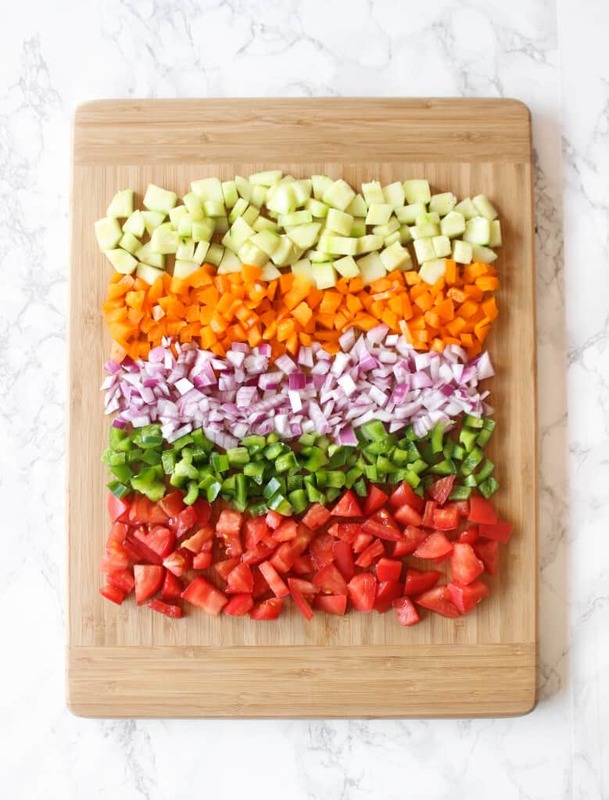 Love the shot of all the chopped veggies! And toppings > lettuce. Haha I think I usually go for a 4:1 ratio, at least. The worst is when there aren’t many and after a few bites, you end up eating a big bowl of just lettuce! This looks so good Liv! So colorful too. I love chickpeas and feta on salads! So so good. 🙂 Have a great day girl! Thanks, Alyssa! The more colors, the better, right? Hope you have a great day, too! Liv! These photos (heart eyes emoji)! I am the same with Greek salad – i can’t get enough of it. I especially love the olives + feta cheese combo. But i love that you added chickpeas for some protein because that’s my single complaint about it. Pinning this! The chickpeas seem to go perfectly in Greek salad! Thanks for pinning, Beverley! Greek salads forevaaa! I love topping mine with tuna salad, but chick peas would be a fun way to switch it up! Tuna salad sounds like a great way to up the protein! this looks amazing! I love chickpeas and greek salad so i know i will LOVE this! 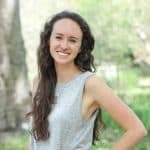 Just stumbled upon your blog through Alison’s! Love it:) Chickpeas have been SO good lately, I’ll have to try this. So fresh for summer, too! Hey Colby! Nice to “meet” you. I’ll head over to check out your blog, too! This is a great idea – combine tasty Greek salad with something more substantial like chickpeas. Will have to try it! Thanks, Elissa! Hope you get a chance to try it! Just found your recipes when I was searching for healthy baked apple recipe for my son. This salad looks really delicious. I’m a Greek food lover as well. I’m also super impressed that you cook all this delicious food in a dorm! Amazing. Keep up your amazing dedication to healthy food. Oh so glad you found my site! Thanks so much for your kind words and hope you get a chance to try my skillet “baked” apples. I’m at home for a few days during my spring break this week and my family requested a batch of those apples already! where’s the tomatoes and olives? ?